New Mexico is a state of the United States of America. It is considered part of the American Southwest and is bordered by Texas to the east, Oklahoma to the northeast, Colorado to the north, and Arizona to the west. The northwest corner of the state also touches Utah. This area is known as the Four Corners because four states meet there. 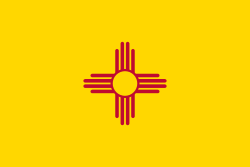 The state has the nickname Land of Enchantment. 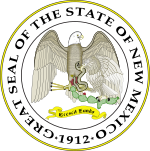 New Mexico became a state on 6 January 1912 and became the 47th state accepted into the United States. The state capital is Santa Fe. New Mexico's population is 2,085,109 and most of the people live in the biggest city, Albuquerque. New Mexico is home to one of the longest trams in the world, the Sandia Peak Tramway, in Albuquerque and one of worlds longest zip lines, the Apache Eagle ZipRider, in Ruidoso. The climate for most of the state is generally semi-arid. In the summer it can be very hot in southern New Mexico. The temperature is sometimes over 100°F (37.8°C) with lows over 70°F (21.1°C). It occasionally snows in the northern part of the state in the winter. It is drier in the southern portion of the state, and it rarely snows. New Mexico is usually affected by the North American monsoon from mid June to late September. New Mexico is the long-time home of the Pueblo people, a group of Native Americans. It was taken over by Spain, which founded Santa Fe in 1608. In the late 1600s, the Pueblo people revolted against the Spanish. The Spanish returned twelve years later. When Mexico became independent, New Mexico was part of it. Like most of what was then Northern Mexico, the area did not have a large amount of people living in it. In 1846, the United States and Mexico went to war over a border dispute in Texas (a former state of Mexico that, after being its own country for a time joined the US), and the United States won the war. The peace treaty the two countries signed gave what is now the American Southwest to the United States. The Mexican citizens living there were allowed to stay if they agreed to become US Citizens; over 90% did. After some time as a territory, the area became a state in 1912. ↑ "Most spoken languages in New Mexico in 2010". MLA Data Center. Retrieved 4 November 2012. ↑ "New Mexico: Population estimates". U.S. Census Bureau. 1 July 2017. Retrieved 6 May 2017. ↑ "Median Annual Household Income". The Henry J. Kaiser Family Foundation. Retrieved 9 December 2016. ↑ "Wheeler". NGS data sheet. U.S. National Geodetic Survey. http://www.ngs.noaa.gov/cgi-bin/ds_mark.prl?PidBox=GM0779. Retrieved 24 October 2011. ↑ 6.0 6.1 "Elevations and Distances in the United States". United States Geological Survey. 2001. Archived from the original on 15 October 2011. Retrieved 24 October 2011. This page was last changed on 13 February 2019, at 15:45.